The significant growth in the property sector across Spain in recent times means realtors need to optimise their sales management to more quickly and efficiently meet requests for information and better understand their customer base. The sector is doing well again, but at the same time there is more competition and a need to stand out. The use of the right technology tools makes it possible to secure better results and boost sales efficiency and effectiveness. 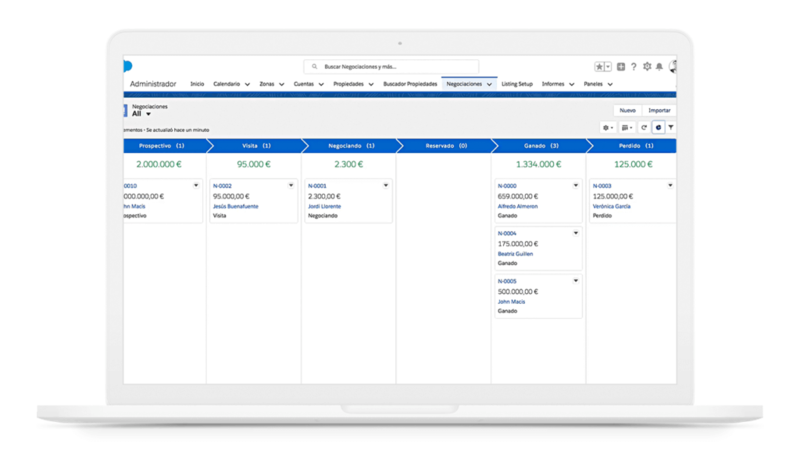 With Activo Real Estate, the Real Estate CRM powered by Salesforce, you can grow your revenue and enhance your productivity. A prospective client can contact us through different channels and it is essential we are ready for them in order to make an efficient use of time and be fast enough to meet their needs. If you have a client who wants to sell or rent their property, with Activo you can coordinate the first visit to appraise it and while you’re there register it on the CRM, take photos and automatically publish it all on the sector’s leading property portals from any mobile device, whether a smartphone or tablet. 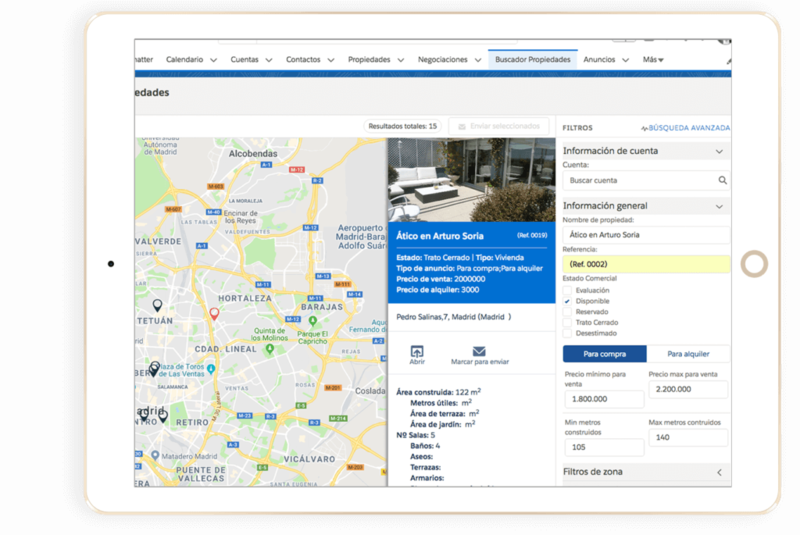 In addition, when an interested party contacts you through these portals, Activo automatically creates a potential client in the system, assigns it to the appropriate sales rep and profiles the property’s features. Activo has functionalities to help you get more contracts faster. 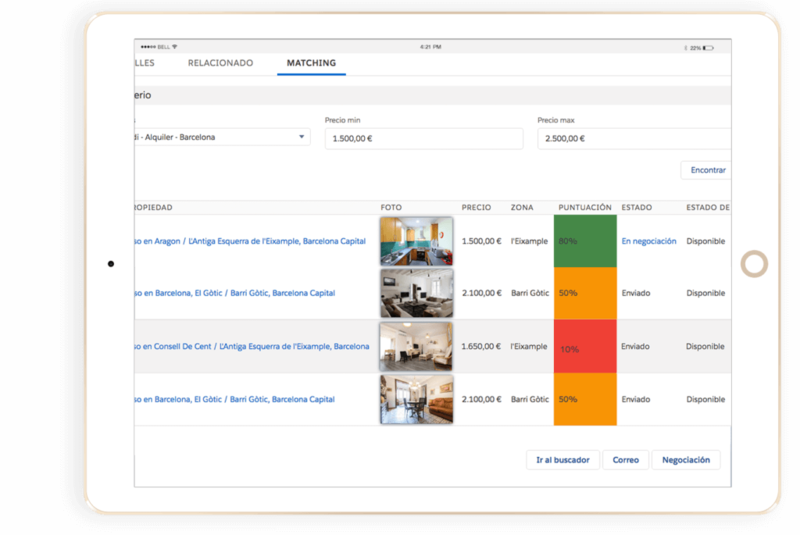 One is “Activo Property Matcher”, a smart tool to cross-reference your customers’ interests with available properties and vice versa, with over 40 preference criteria. You can review properties using a scoring model based on similarity of characteristics, choose the ones you consider important and send them to the potential customer via an email synchronised with Gmail or Office 365. The customer will get a personalised email with a list of properties that may be of interest to them. Think about it: every time someone contacts you via a portal you can send them a list of properties that is distinctly possible to interest them within two minutes! 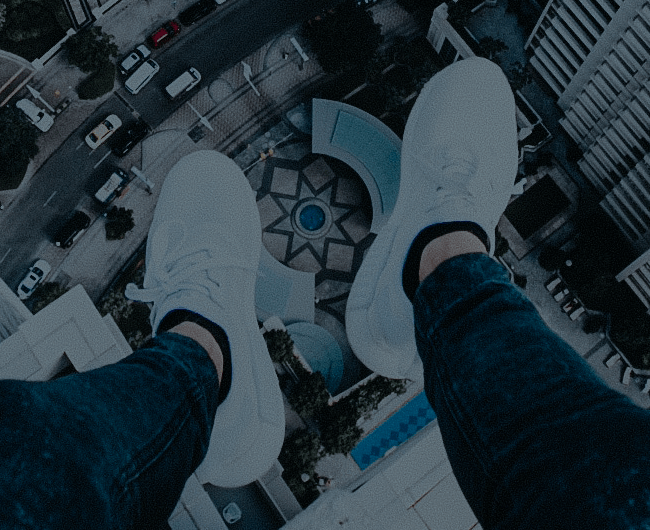 Everyone in the property game knows that the first person to contact a customer is very likely to get that customer, so if on top of that you can send them highly relevant information… they’re yours for the taking! A key part of your job involves scheduling visits and showing people around properties. There are inevitably times when they don’t seem very taken with the property in question and want to see more options. 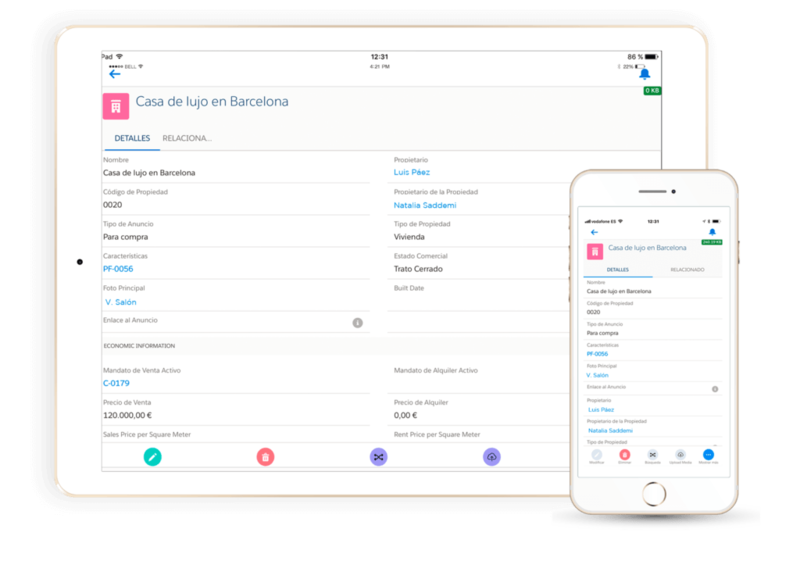 What you can do with “Activo Property Search” is show them the location on a map of nearby properties with similar features and all the information and photos available in order to decide whether it’s worth arranging a visit, either then and there or later. At the end of the day, blindly going off to show people around a place isn’t a good use of either your time or theirs. Throughout the process we can sometimes let information escape us so, to improve customer relations and boost productivity, you can use the tracking tools provided by Activo to log and view all interactions with your customers, whether it’s calls, events in your calendar, visits or emails. The idea is to have all customer interactions logged so you can have everything you’ve discussed to date to hand. As a realtor, you spend a lot of time away from the office and to keep track of all your activities and best follow and log them, you can access all your information from the mobile app anytime, anywhere and from any device. Also, it’s unrealistic to think that someone needs to wait until they get back to the office to write down the important takeaways from a visit. What if you could dictate them into your phone and have the phone write up the report? You could do it from the car on your way back to work! To be an industry leader, efforts must be focused on continuous improvement and growing the business. That’s why it’s essential to be able to measure, project and monitor your targets. Ultimately, the only way to improve is by measuring and taking action where you can see how results are going. With Activo you can view the state of all your negotiations and project your income quickly and simply. Another important tool to consider are the incredibly powerful, 100% customisable reports and dashboards which can be used to measure your key commercial activities, focus on the most important ones, make sound decisions and have an overview of the business. 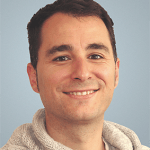 Do you want to measure the number of visits per salesperson per week? See the total number or amount of negotiations concerning down payments? Know which customers you haven’t contacted in the last “x” number of days? Or properties that have been priced down? With Activo you get this and more!